This innovative and unique concept is easily understood and profitable! First, let’s begin by stating that the “BETTING SITUATION” concept is NOT a system. It does not re-invent the wheel. But it is a time-tested, proven method, using the same readily available past performances, tote board and official entry information as the Pro’s. 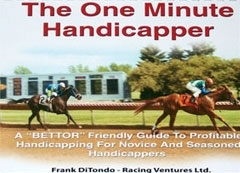 Most importantly, The One Minute Handicapper will teach you how to consistently pick winners! Everything You Need to Begin Picking Winners like never before! — Rich Nilsen, publisher, 12-time NHC qualifier, and former captain of the profitable Players’ Pool syndicate. If you would first like to read the e-book, then please download the PDF version of The One Minute Handicapper right here for only $14.97. Instant download. Please note the Print version of this book is completely sold out! Start winning consistently with help from The One Minute Handicapper! Are you wagering with a rebate? Are you tired of points that don't add up to much? Get hooked up with a real rewards program. Learn more here.